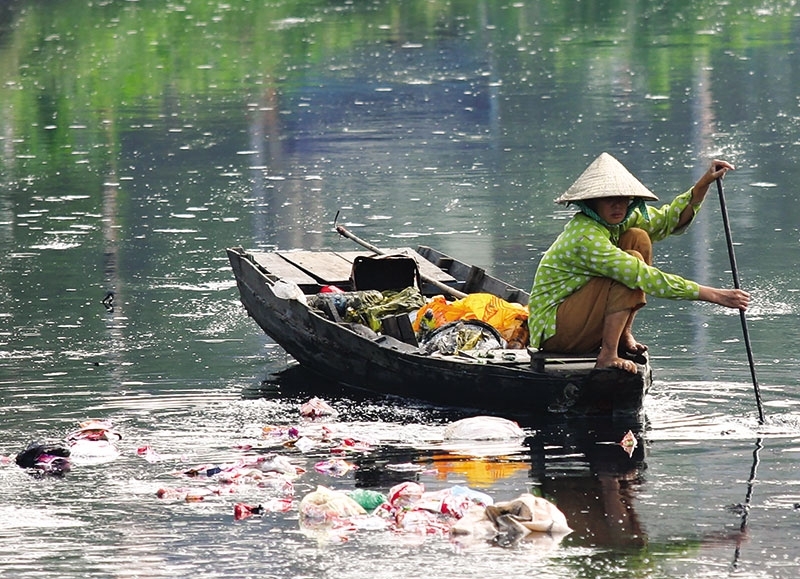 While many Vietnamese people do not think that single-use plastic items like cups , straws or bags could harm the planet, the consequences of plastic pollution of the world’s oceans are all too real. However, a global change in mindset is now taking its first steps in Vietnam. When I heard about how a rare green turtle had died from eating plastic bags, mistaking them for jellyfish – its favourite food – I suddenly became acutely aware of my lifestyle choices. Looking down at my work desk, I see a bunch of beautiful red roses that will never wither as they are made entirely of plastic, and some empty plastic containers that used to hold individually-wrapped sweets. Reflecting honestly for a moment, I realised these are only small examples of a wider disposable plastic habit that I should be ashamed of, being someone who hopes to contribute to a better environment. Earlier, I picked up a bubble tea served in a tall plastic cup, sealed with a plastic cover, pierced with a plastic straw, and carried in a plastic bag – all just so I could escape the heat, transporting it the 100 metres to my office in central Hanoi. Looking more closely at my afternoon treat, I come to understand that, like the chewy tapioca pearls bobbing in my cup, I am only a speck in the mass consumption of plastic in Vietnam, where the creamy, sweet, flavoured tea is a widespread attraction for thirsty drinkers all over the country. Since the turn of the millennium, the Taiwanese bubble tea phenomenon has altered drinking habits and come to be considered the “king of beverages”, with studies showing there is still room for the ready-to-drink tea to grow further in the market. According to London-based researcher Euromonitor International, the Vietnamese milk tea market is valued at $282 million and has an annual growth rate of around 20 per cent. Euromonitor data ranks Vietnam the world’s fifth-biggest consumer of bubble tea, with over 1.3 million litres sold in 2017 – more than in Taiwan, the home of bubble tea, and only just behind Indonesia, which boasts a population nearly three times the size. Due to climbing profits, every four days on average in Vietnam currently see the establishment of a new milk tea shop. Searches on the top food and beverage application Foody show there are more than 5,000 places selling bubble tea in the three biggest cities of Hanoi, Danang, and Ho Chi Minh City. The application also calculates that the remaining 60 cities and provinces have somewhere between dozens and hundreds of bubble tea shops. These are only the sweet spots listed on the app, with the reality being an even greater figure. According to a local bubble tea shop proprietor at Trich Sai street in Hanoi, the transparency of the plastic cup creates a more beautiful serving, as customers can see its individual layers of fresh fruit or custard pudding added to provide a richer taste. As an on-the-go drink, the straw is necessary to stir the drink’s components. “Imagine buying an iced takeaway beverage without a straw. With the ice melting, the drink becomes diluted and sediment will settle,” he explains. At the same time, he told VIR that sellers seal the cups for takeaway customers to prevent spillage, and so a straw is also necessary to pierce through the film. Nguyen Thu Hang, who works in a local media company, always uses a straw to keep her lipstick intact and to avoid getting a ‘milk moustache’ when she has her favourite creamy tea. Like Hang, a mother of two sons, Nguyen Phuong Mai told VIR she felt safer letting her kids use a straw with their milk boxes, as she fears they would get dirty at some point during the transportation process. While both Hang and Mai do not think the use of small disposable straws can do damage to the environment, an environmental organisation that discourages the use of plastic straws, Strawless Ocean, confirmed that they are indeed destroying marine life. It is estimated that more than one million sea birds, 100,000 marine mammals, and countless fish are killed by plastic pollution each year. Straws are one of the top 10 contributors to sea pollution. In fact, a turtle was once found with over 1,000 pieces of plastic in its stomach. Strawless Ocean explained that as most plastic straws are too lightweight to make it through the mechanical recycling sorter, they drop through sorting screens and mix with other materials that are too small to separate, contaminating recycling loads or being disposed as garbage. Unable to biodegrade quickly, they then wind up in the ocean. What is more, straws create pollution at every stage of their existence, from oil drilling and manufacturing to shipping and distribution. It is estimated that 8 per cent of the world’s oil production is used to manufacture plastics. Strawless Ocean states that 71 per cent of seabirds and 30 per cent of turtles have been found with plastics in their stomachs. Plastic can remain in the environment for over 2,000 years without degrading. At the launch of the “End Plastic Pollution” campaign last month, the US Embassy in Vietnam quoted a University of Georgia study from 2015 saying that Vietnam was the fourth-greatest contributor to plastic ocean pollution worldwide. 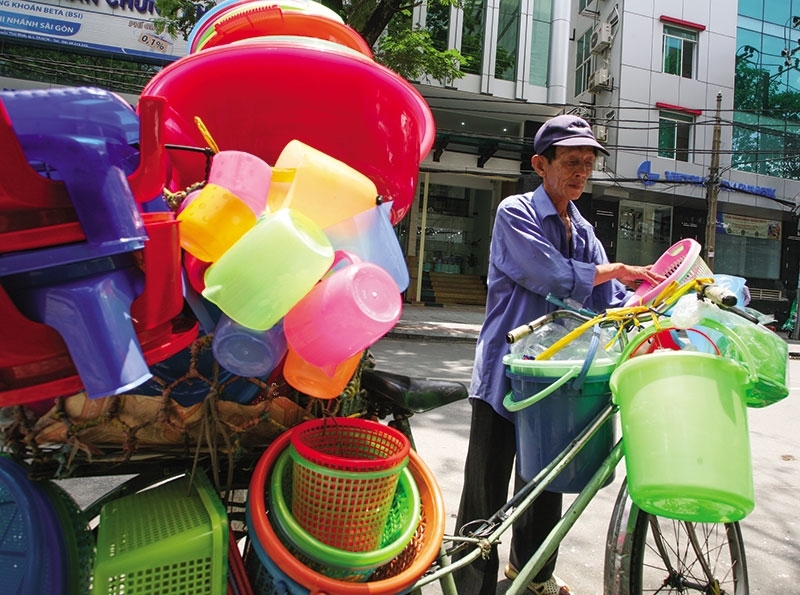 While there are no official figures on how much plastic material is used in the local food and beverage industry, Nghiem Thanh Tung, who produces plastic cups and straws for bubble tea shops, told VIR that some of their larger client locations are likely to place orders of around 10,000 plastic cups, with about 20 kilogrammes of plastic straws every three months. At the same time, a number of countries around the world have taken major steps to cut plastic waste. Chile has prohibited the sale of single-use plastic bags in 102 coastal villages and towns. Kenya introduced a law that slaps a fine, or even a gaol sentence, on anyone who manufactures, sells, or even carries a plastic bag. And just last month, Scotland announced plans to ban the manufacture and sale of plastic-stemmed cotton buds. As the birthplace of bubble tea, Taiwan recently vowed to ban all single-use plastics for an entire switch to reusable or biodegradable items. Under the plan, plastic beverage cups will be restricted and, by 2025, users will have to pay an extra fee to use them. By 2030, plastic takeaway beverage cups will be completely banned. In Vietnam, while the majority of the growing bubble tea industry has not yet reacted to environmental concerns, a cafe in Ho Chi Minh City recently called on its clients to bring their own cups and plastic bags, and either to bring their own straws or use none at all. Responding to the global “Say No to Straws” movement, the cafe offered customers a small discount of VND5,000 ($0.2) for their efforts. Moreover, several beverage shops have begun using non-plastic straws, made of bamboo, stainless steel, glass, or silicone. Hung’s business has grown fivefold since it began three year ago, and he is looking to develop more environmentally friendly products such as trays, glasses, bowls, and shopping bags to serve the growing global demand.Nguyen Dang Hung, CEO of Bamboo Straw Vietnam, told VIR he is currently selling bamboo straws on the international market, especially in Europe, where the anti-plastic trend is much stronger. There are many countries that have banned the use of plastic straws, which creates a huge opening in the market for Hung and his colleagues. Local partnerships for Hung’s business have been hard to come by in Vietnam, as the higher prices of environmentally friendly straws remain a key issue. Currently, a single bamboo straw costs VND9,000 ($0.40), while 500 plastic straws, weighing one kilogramme, cost only VND50,000 ($2.20). This makes a bamboo straw around 90 times more expensive than a plastic one. However, Hung still managed to team up with the likes of the Chàouen Lounge, Hanoi Taco Bar, and Winston’s bar, all in Hanoi. Outside of the city, he has found clients such as Premier Village resorts, Amanoi resorts, and the InterContinental’s Phu Quoc and Danang sites. Hung believed that although environmentally friendly habits in Vietnam are not as prevalent as in other countries, small steps are still “such a positive change”, with a rise in public awareness of potentially enormous environmental detriments caused by small objects like straws. As for me, I have just finished mixing my Moringa drink in a glass bottle, which used to contain Japanese Choya wine, and am having it without a straw. I am telling myself I need to create a more environmentally friendly lifestyle because I love being by the sea and care about marine life. More importantly, I would like my children and grandchildren to see turtles, fish, and other creatures in the ocean in the future, not just floating plastic./.